The instrument I play on was designed by Luis Leguia (www.luisandclark.com), a cellist with the Boston Symphony Orchestra. It sounds very similar to good wooden cellos – I own an old wooden cello from the late 18th Century. At the same time it is a little richer in overtones and has a larger dynamic range (louder sound). It also responds very well to plucking in the higher and lower range. The pegs are mechanical which makes it easy to tune and also allows me to tune the cello in unconventional ways. Carbon fibre is, however, not wood, and it was quite an adventure to start playing this type of cello. I needed to get used to the material and to adjust my playing technique, and the bow and the strings, to find the sound I was ‘listening for’. 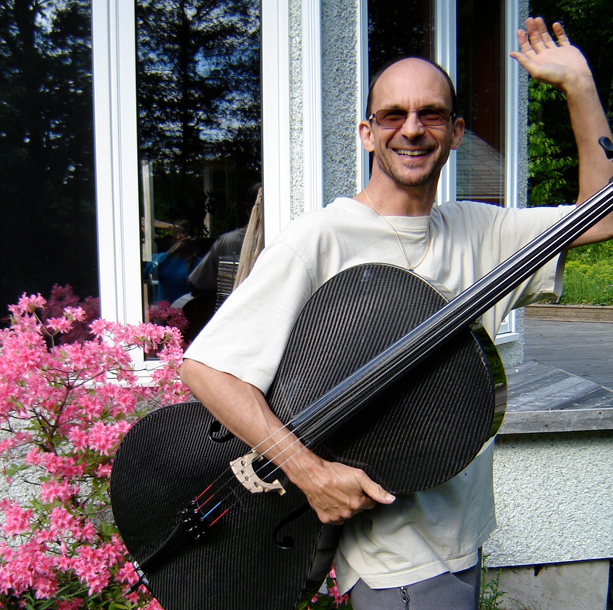 At the same time, my carbon fibre cello is easier to bow because it lies closer to the chest than conventional cellos. It is a common belief that wooden cellos, particularly older ones, have a ‘soul’ and more ‘feel’. I am a lover of ethnic and wooden instruments in general, but in spite of this, experience has taught me over many years that the ‘soul’ – the capacity to touch the human heart – depends primarily on the musician’s presence and touch. In my view, a modern material such as carbon fibre has the same potential to touch the heart as any conventionally-used material. Anyway, I love my carbon fibre cello for its playful qualities. It allows me to play indoors and outdoors or in nature without worrying about humidity, heat or cold. I have never been so relaxed about travelling as I have been with this cello (Canada, India, Costa Rica, Europe etc.). For a cellist these are important factors. Our possibility for movement is already limited by having to mainly sit while playing. For amplification on stage, I use either a condenser microphone or a ‘shadow’ pick-up under the bridge, which has excellent sound response and no feed-back. Carbon fibre reinforced composites are very strong for their weight. They can be stronger than steel but are much lighter. They are mostly used to replace metals in parts of airplanes and space shuttles, skis, fishing poles and boats. At the same time, carbon fibre has similar vibratory qualities to wood which makes it suitable for stringed instruments and bows.